Yes, I am very particular, especially with barbecue. I had this special once before, when I fiercely debated about why cole slaw is added on a BBQ pulled-chicken sandwich, or montadito. (I still think the practice is rather weird.) Also, thanks to a tense workday dealing with data entry problems, I needed comfort food, which in my universe includes both Mexican and barbecue. 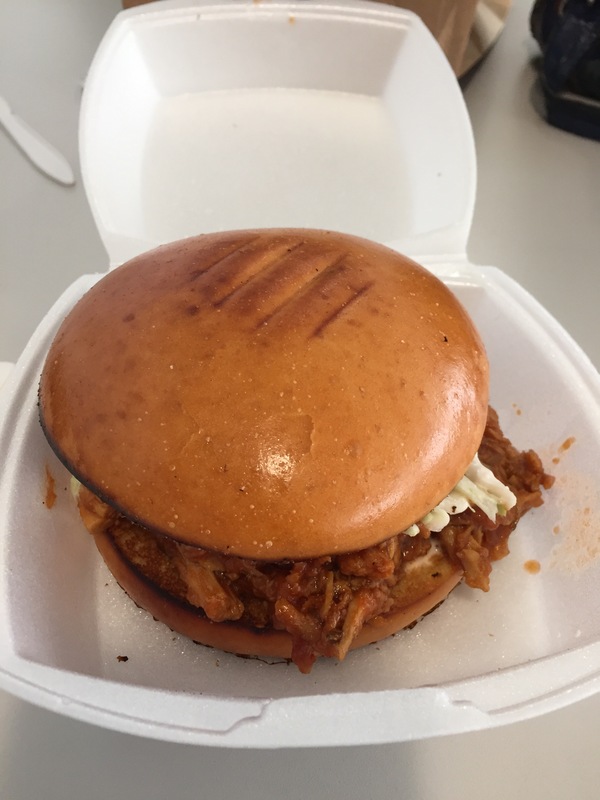 As I dissected the sandwich and marveled at the creaminess of the cole slaw (it’s sort of too sour/vinegary for my taste), I tried the pulled chicken. It’s very mild tomato sauce, and it was a little too sweet for my taste. It needs a bit of a zing in the sauce to make it perfect, or Memphis/Kansas City type of barbecue, which does celebrate the “sweet” sauces to go with the meat. (I personally prefer Texas-style…Again, I’m very choosy about barbecue. It’s born in me.